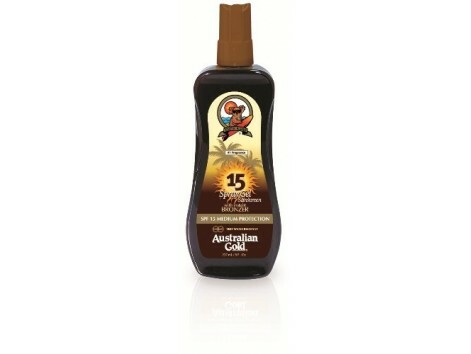 Australian Gold Bronzer Spray Gel 237ml SPF15. Low Protection. Spray Gels with Australian Gold Bronzes are No. 1 in the United States, Canada They offer optimal protection against the sun's rays but also contain bronzers that will help you get a deep brown color more quickly and safely. You'll love its light touch, quick absorption and irresistible aroma! 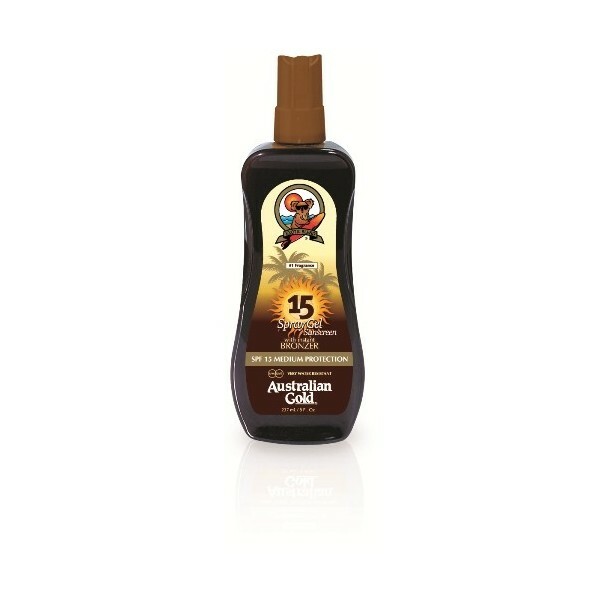 If you have dark hair and eyes black or brown, you probably have a phototype III and can use Australian Gold SPF 10 (less dark skins) or SPF 6 (brown skins). International Pharmacy Recommendation: If you have fair skin, blond hair and light eyes it's likely that your skin is Phototype II. In this case we recommend using Australian Gold SPF 30. Then, when you get more tan color can pass SPF 15. If your skin is too white, you redhead / or Phototype I'll recommend and SPF 50. After getting a better color can pass SPF 30. In any case you'll get immediate dark thanks to our exclusive gilded bronze .. As for the package we have another good news! Since you will not get the nerves with these tubes or screw cap bottles impractical. In practical spray pump system that never fails!